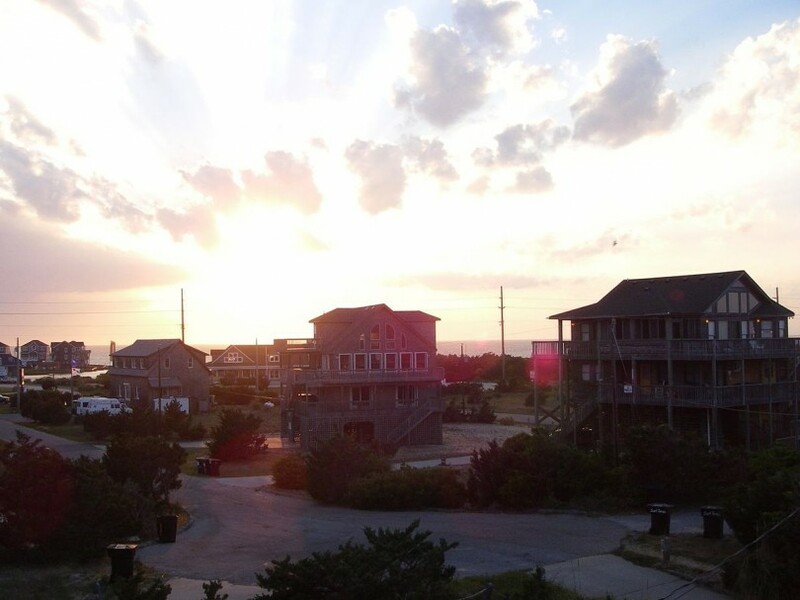 A sunset over Avon on the Outer Banks of North Carolina where tropical storm Arthur is expected to become a hurricane going into Thursday. Cape Hatteras Island will begin mandatory evacuations starting tomorrow morning at 5am as tropical storm Arthur approaches and strengthens to a hurricane overnight. A mandatory evacuation means that if you decide to stay, no emergency services will be provided and you may lose power during the storm. It is expected to become a category one hurricane Thursday as many forecasts show it tracking slightly westward, making it more of a threat due to flooding concerns along the coast. The highway onto Hatteras Island will be shut down starting tomorrow and no one will be allowed on or off the island. Route 13 heading down Maryland’s eastern shore should remain open, but The Chesapeake Bay Bridge tunnel that route 13 runs on may be shut down if the weather conditions warrant as the storm approaches. UPDATE – If winds at the mouth of the Chesapeake where the Bridge tunnel is located go over 65 mph, the bridge will be closed to traffic. Arthur is expected to become a hurricane with winds of at least 85 mph, so there remains a good possibility the bridge-tunnel will be closed to traffic as it nears the mouth of the Chesapeake Thursday night. Level 1	40 miles per hour	The following types of vehicles will not be allowed to cross the facility during Level 1 wind restrictions: large pick-up campers; camper trailers; house trailers; anything being towed; vehicles with any exterior cargo. Level 2	47 miles per hour	The following types of vehicles will not be allowed to cross the facility during Level 2 wind restrictions: motorcycles; large pick-up campers; camper trailers; house trailers; anything being towed; vehicles with any exterior cargo; empty tractor-trailers, not to include empty tanker trucks*; small six-wheel trucks such as moving vans, rental trucks, school buses, etc. Tractor-trailers must gross 30,000 pounds payload in addition to the weight of the rig and six-wheel trucks must gross 15,000 pounds payload in addition to the weight of the rig in order to be allowed to cross the facility during Level 2 wind restrictions. Tractors without trailers are allowed to cross. *Empty tanker trucks are allowed to cross under Level 2 wind restrictions. Level 3	55 miles per hour	The only types of vehicles allowed to cross are cars without exterior cargo; pick-up trucks without cargo; mini-vans; vans not to include high-profile/conversion vans; SUVs; tractors without trailers; empty flatbed trailers, commercial buses and heavily-laden tractor-trailers with a 40,000 payload in addition to the rig. Level 4	60 miles per hour	The only types of vehicles allowed to cross are cars without exterior cargo, pick-up trucks without cargo, mini-vans, and SUVs. The only types of vehicles allowed to cross are CARS without exterior cargo. The Chesapeake Bay Bridge-Tunnel is closed to all traffic due to unforeseen weather conditions or safety concerns. We strive to make this interruption to traffic as short as possible.